I am still kicking myself over this one. 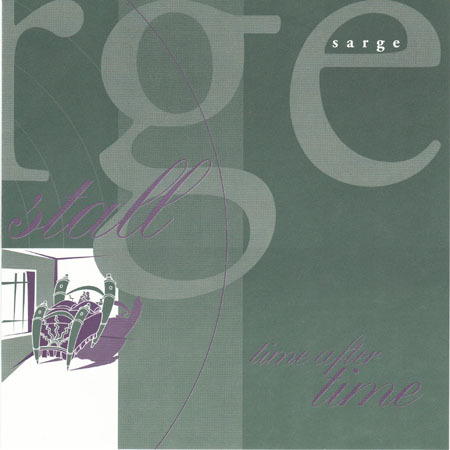 As tuned into the indie scene as I was in the mid-'90s, and as much of a sucker as I was for female-fronted indie rock at that point, I completely missed Sarge. I am still trying to figure this out. 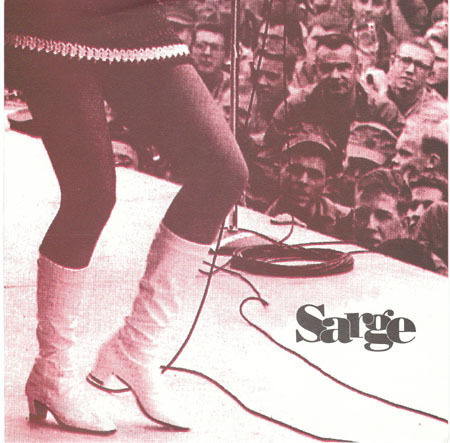 I ate up everything that sounded like Sarge during those years, and yet...just never came across Sarge. 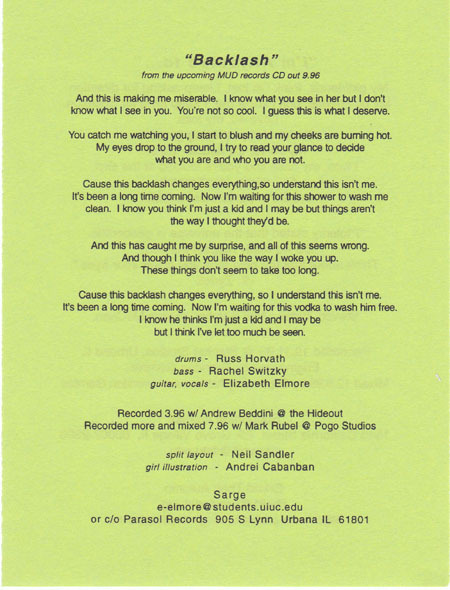 I even received monthly mail order updates from Parasol Records (parent company of Mud Records, which put out all of Sarge's stuff), and STILL managed to never cross paths with anything Eliabeth Elmore did until sometime in 2006. Really. It's inexcusable. I hang my head in shame. Here I go. From a collecting standpoint, I guess the silver lining for me is that there was not all that much Sarge or Reputation vinyl released during my years of ignorance. Everything on this page is worth your time. 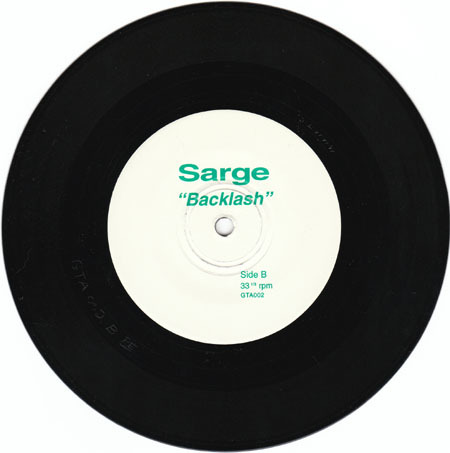 Sarge was not originally intended to be the second band on this split, but the original one fell through at the last minute, and they were given the opportunity. I have read that there are 1000 copies of this one out there. It is on translucent black vinyl. Great single. Apparently, the A side got some good press while I had my head in the sand. It seems there were (at least) two releases for this single. By random chance, I happened upon two different versions. They are almost identical, save for the web site URL on the back of the sleeve and the insert. 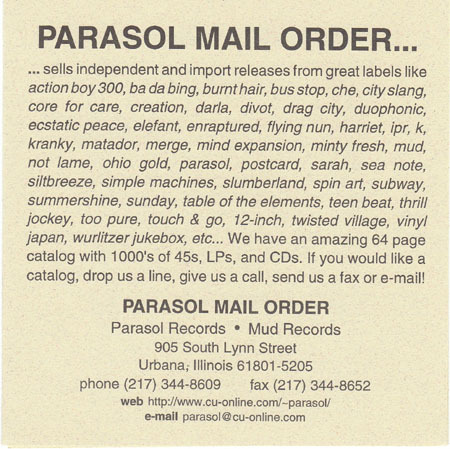 The earlier one has a "cu-online.com" web site listed, and the later one has the full Parasol Records address, alogn with an updated "indies.com" URL (see pic below). 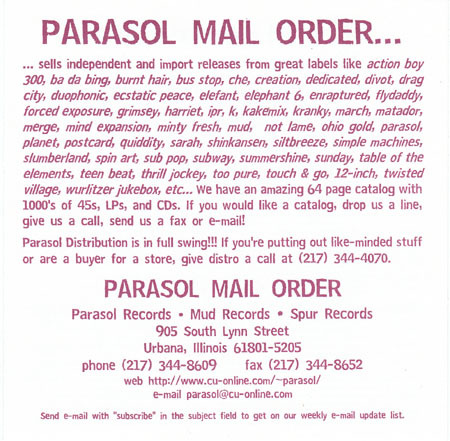 Both releases contain Parasol catalogue inserts. The earlier one is on beige paper; the later one is on white, and has a more extensive catalogue listed. The vinyl is translucent black. The first time I heard Charcoal, I thought it could have been a follow-up Tiger Trap album. A little underdeveloped compared to what Sarge would become, but that's to be expected. Excellent album overall. It is only available on CD. 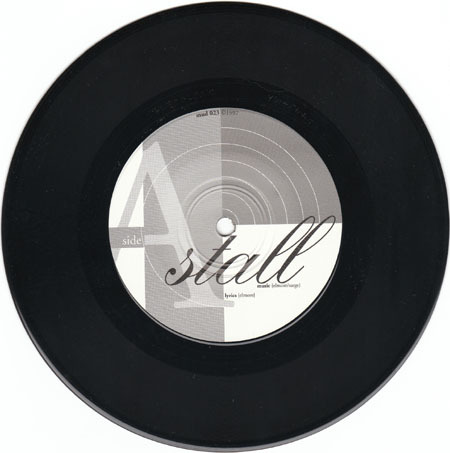 This was a solid 7" that bridged the gap between albums. Good stuff. Elizabeth doing a Cyndi Lauper song is fun. Translucent black vinyl. Things really started to come together for the second Sarge album. There are several songs on here that beg to be heard repeatedly. 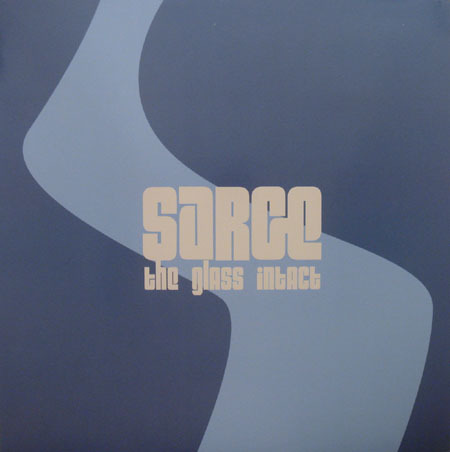 The Glass Intact did come out on vinyl. 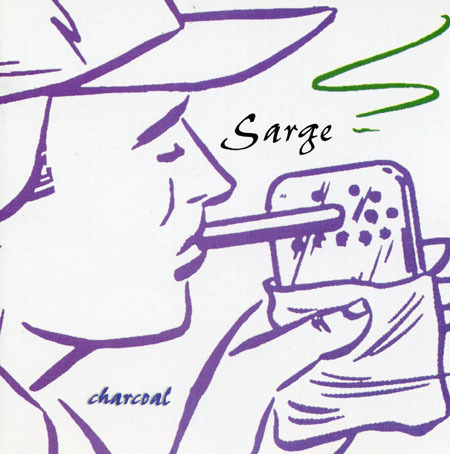 Sarge broke up in late 1999, but had recorded a few songs before the band's demise. 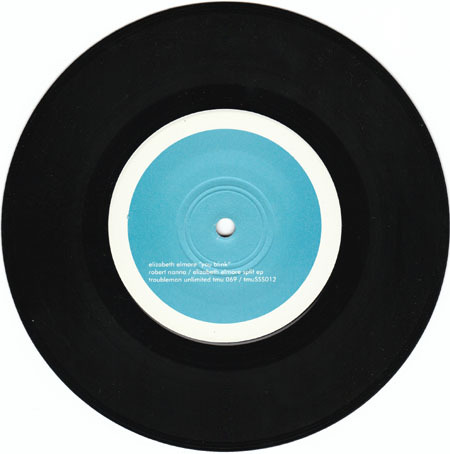 Elizabeth put those together, along with a few live tracks and b-sides, and released Distant in 2000. She then did a small solo tour to promote the album. There is some spectacular material on here. 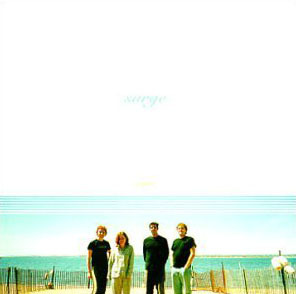 The songs began to take on a deeply personal quality (which had always been there to some degree...songs like "The End of July" took that to another level). CD only. 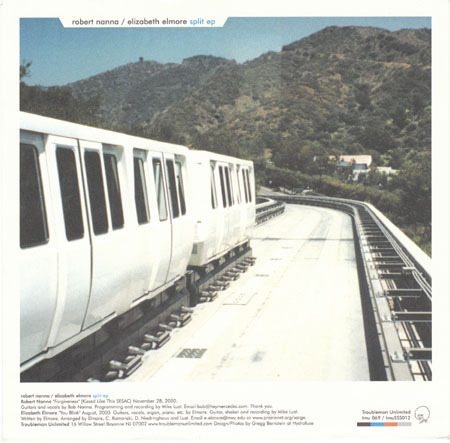 Robert Nanna/Elizabeth Elmore Split 7"
Elizabeth's music career appeared to be in limbo when this single came out. 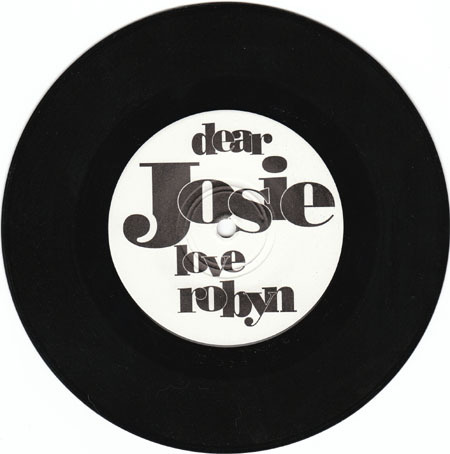 She did a split single with Bob Nanna from Braid, as part of a split single series done by Troubleman Unlimited. "You Blink" is a very solid song. 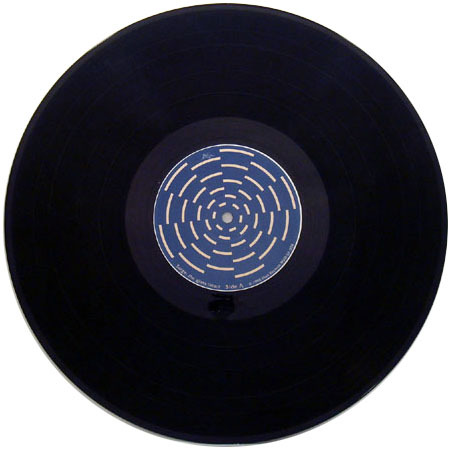 Black vinyl, also available on cd and some download sites (eMusic comes to mind). I am including it with Sarge because it feels more like Sarge than the Reputation.